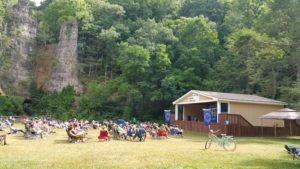 The 38th Annual BRANA Campout will be held on July 19 –21, 2019 at Natural Chimneys Campground in Mount Solon, VA (map). The BRANA Campout Planning Committee will meet at 11 am on Saturday, March 30th, 2019 at 441 Ohio Ave., Harrisonburg, VA to continue the planning for the 38th Annual BRANA Campout. We have completed the BRANA 38 – “Simplicity is the Key” artwork. Our Planning Committee is working hard on recruiting speakers and all the other details to make this a great event. We are all looking forward to another great turnout in July! Register Now! We are providing a Printable Flyer for your use in circulating to Homegroups and Areas/Regions. We are looking for speakers who carry a strong NA message and can share their experience, strength and hope on the 12 Steps, sponsorship, service work, their relationship with a Higher Power and the miracle of one addict helping another. BRANA Campout does not pay travel expenses, lodging or in any way compensate any individual that speaks at our events. We feel that the message of recovery should be one that is given freely. We are consistent in that policy as it also pertains to speaker recordings, offering them as a free download on our site. The BRANA Campout Planning Committee will meet at 11 am on Saturday, Janauary 26th, 2019 at 2394 Melrose Rd Harrisonburg, VA to continue the planning for the 38th Annual BRANA Campout. The BRANA Campout Planning Committee will meet at 11 am on Saturday, December 29th, 2018 at 2394 Melrose Rd Harrisonburg, VA to continue the planning for the 38th Annual BRANA Campout. 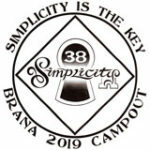 “Simplicity is the Key” has been selected as the theme for the 38th Annual BRANA Campout. The theme was selected from a number of suggestions submitted by NA members. Thanks to everyone who submitted ideas! We are developing artwork for the new logo and the Planning Committee is at work planning for the event. Looking forward to seeing you all the third weekend in July 2019! The BRANA Campout Planning Committee will meet at 11 am on Saturday, November 17, 2018 at 441 Ohio Ave., Harrisonburg, VA to continue the planning for the 38th Annual BRANA Campout. The BRANA Campout Planning Committee has begun the planning for the 38th Annual BRANA Campout, to be held July 19-21, 2019, at Natural Chimneys Campground in Mount Solon, VA.
We would like to ask you for your input to help us choose a theme for the Campout. Any Narcotics Anonymous member may submit a theme. Do not send logo or artwork ideas, just themes. Recent themes include “Carry the Message”, “Freedom to Live”, “The Journey Continues”, “We Do Recover”, “Against All Odds”, “Alive and Free”, “A Spiritual Awakening”, “A New Way to Live”, “No Matter What” and “Giving It Away”. The BRANA Campout Planning Committee will meet at 11 am on Saturday, September 29, 2018 at 441 Ohio Ave., Harrisonburg, VA to begin the planning for the 38th Annual BRANA Campout.